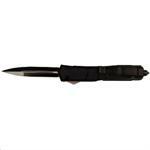 The CIA letter opener is specially designed for "Special Ops" and is made of a dense, durable, non-metallic, non-magnetic state of the art material. These Extra Large Godfather Italians are hard to find. Used and sold to the hit series "Sons of Anarchy" they are the largest available. GET EM NOW while I have em. Hidden button automatic knife. Push the hidden button underneath the rubberized handle and the blade springs open. Lever lock automatic knife.True Collectors item. Just a flip of the lever and the blade is released. We expect these to be a one time purchase, so we a will be limited to what we have on hand. Awesome OTF "Out the Front" Black ops knife with 3 1/2" blade and glass breaker pommel.. Get this one Now before we run out. One Awesome Black Pen Knives that is refillable. 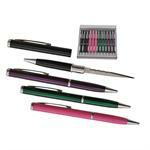 Excellent Quality Pen and Razor Dangerously Sharp. US WWI Trench Knife from 1918. Has a double-edge knife, knuckles, and a skull crusher.True Collectors item.